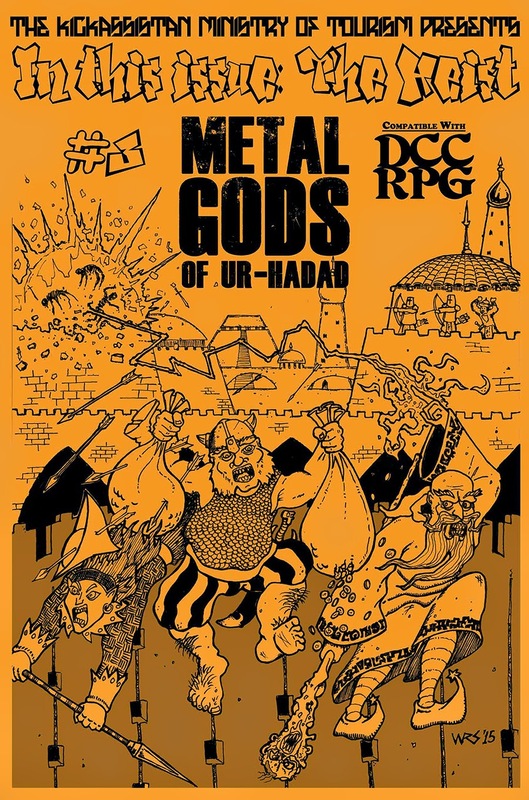 In January, 2014, +Edgar Johnson, +Wayne Snyder & I began to publish the Metal Gods of Ur-Hadad fanzine for the Dungeon Crawl Classics RPG. The 'zine is a labor of love that we're trying hard to put out quarterly, with one issue per season. Man has forged a sword and cast off his chains. Swords and Sorcery and Metal Gods. And served up in Golden Ur-Hadad, First City of Ore.
On the side of your cousin's Ford custom van. 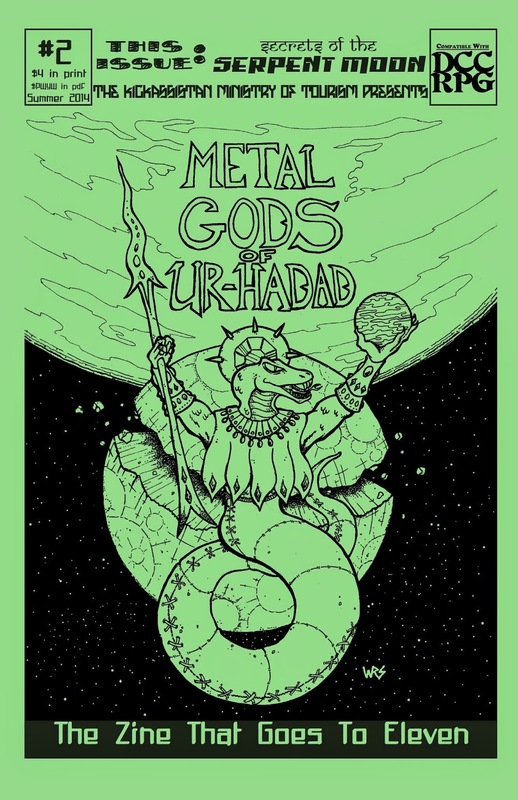 Enter the world of the Metal Gods of Ur-Hadad. Get the Pay-What-You-Want PDF at RPGNow and DriveThruRPG! Buy Issue #2 in Print! You've waited long enough. 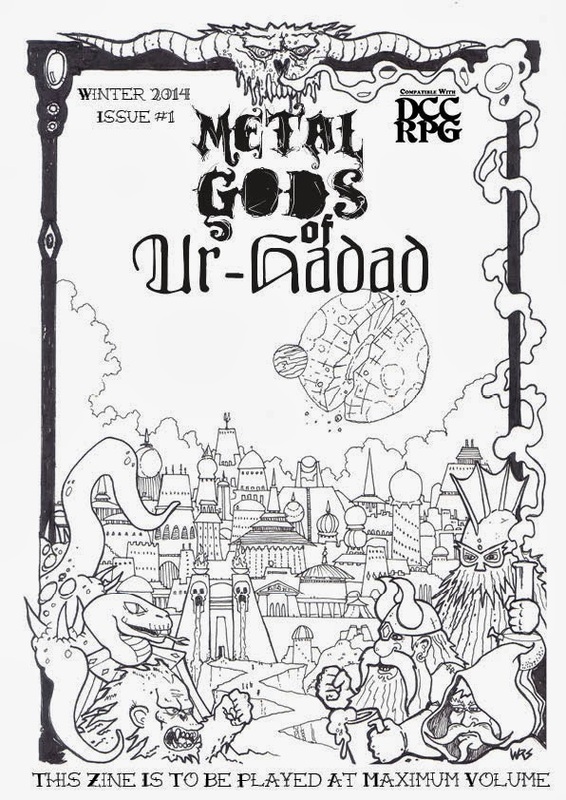 The second issue of the Metal Gods of Ur-Hadad is here! A Wayne Snyder Dungeon Insert: the Starcophagus of the Crimson Prophet! This issue is produced in support of Purple Sorcerer Games and their excellent web tools for the DCC RPG which you can find at http://purplesorcerer.com. Any donations over and above the sticker price of $4 for this product will go to support the maintenance and development of Purple Sorcerer's excellent tools suite. Buy Issue #1 in pdf! This issue has been produced in support of StandUp For Kids, a non-profit, non-partisan charitable organization dedicated to fighting teenage homelessness with a proven track record and 94% of donations being spent on youth in the organization's programs. When purchasing your print copy of this issue, you may pay more than the minimum amount and every dollar beyond the base price will be donated to StandUp For Kids. If you plan on purchasing the Pay-What-You-Want pdf version of the zine, 50% of all proceeds from the sale of the pdf will also be donated to StandUp For Kids, so you've got plenty of ways to choose how to help. Or not to. No one's going to make you do anything you don't want to, but we'll offer you the opportunity to help as much as you see fit.